The Wellesley Blue enjoyed another successful season this spring! Two teams captured NEWMAC titles, while three have earned NCAA bids. Wellesley crew and softball won 2014 NEWMAC Championships and both nabbed berths in their respective NCAA Championships. The softball team wrapped up its appearance with a runner-up finish at the NCAA Regional over the May 11-12 weekend, while the rowing team will head to Indianapolis, Ind., to compete beginning May 30. In addition to the team bids to NCAA Championships, Wellesley tennis players Sojung Lee ’15 and Carina Chen ’17 have earned spots at the NCAA Division III Doubles Championships. Lee and Chen will head to Claremont, Calif., to compete in the tournament, which begins on May 22. Follow along with the action on Wellesley’s newly re-designed Athletics website at wellesleyblue.com. The new site is live as of 12 p.m. on Friday, May 16. Wellesley Crew continued a successful year by winning the 2014 NEWMAC Championship. Wellesley also captured the Florence Smith points trophy, winning each for the fourth-straight season. Individually, Becca Kimball ’14 was named NEWMAC Rower of the Year and head coach Tessa Spillane earned NEWMAC Coach of the Year honors. The Blue had strong races at both the New England Championships and ECAC National Invitational Regatta, earning the team a bid to the 2014 NCAA Championships. Wellesley makes an appearance at the national event for the fifth year in a row, and will head to Indianapolis, Ind., May 30 to compete. The Wellesley golf team competed in three events this spring, closing out the season with a fourth-place finish at the Liberty League Championships. Highlighting the event was a hole-in-one for Alexandria Lee ’15, who accomplished the feat for the second time in her career and the first competing for the Blue. Jacqueline Lu ’17 also competed well at the conference championships, ranking 14th overall in the 35-golfer field. Wellesley Lacrosse finished the season with a 6-9 overall record, with five of the team’s 15 games being decided by two goals or less. The Blue closed out the home schedule with a thrilling 10-9 victory over NEWMAC finalist, Babson, marking the first win for Wellesley over the Beavers in seven years. Closing out the season, Wendy Nettleton ’17 was named NEWMAC Rookie of the Year, while Claire Canty ’15 and Meghan Peterson ’15 joined Nettleton on the All-Conference team. The Wellesley softball team finished a fantastic 2014 season with a 29-10 overall record. The Blue earned an NCAA berth for the third time in program history, closing out their appearance in the tournament as Regional Runner-Up. Wellesley also won the second NEWMAC Championship in program history, finishing the tournament undefeated. Individually, Keri O’Meara was named NEWMAC Coach of the Year, Emilyrose Havrilla ’15 was named NEWMAC Player of the Year, and Ashtyn Coleman ’17 was named NEWMAC Rookie of the Year. Havrilla, Coleman, Jayne Ellis ’14, Lindsay Johnson ’14, and Jennifer Migliore ’14 were named All-Conference selections, while Havrilla, Coleman, Ellis, and Johnson were also named to the All-Region team. The Wellesley tennis team played a nationally-ranked schedule this spring, finishing the year with a 14-8 overall record. The Blue captured the 2014 Seven Sisters Championship in April, with a thrilling 3-2 win over Vassar. At the Seven Sisters event, Carina Chen ’17, Andjela Stojkovic ’17, and Lina Ye ’17 were named to the All-Tournament team. 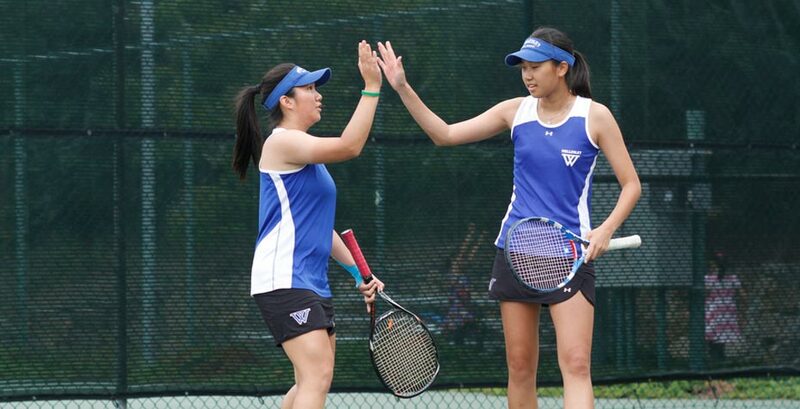 Wellesley’s Chen and Sojung Lee ’15 earned the program’s first NCAA individual bids since 2008, and will compete at the NCAA Division III Doubles Championship beginning May 22 in Claremont, Calif. Additionally, Lee is the first alternate for the NCAA Singles Championship. Wellesley Track and Field enjoyed a solid outdoor season this spring. The Blue had a record 17 scorers at the NEWMAC Championships, finishing sixth overall as a team at the event. Alice Zhou ’17 earned All-Conference honors with a second-place finish in the 10,000-meter event, while Isabella Narvaez ’17 recorded four podium finishes. At the regional level, Zhou and Priyanka Fouda ’16 earned All-New England honors, while a record 12 Wellesley student-athletes will compete at the ECAC Championships May 15 and 16 at RPI in Troy, N.Y.
Congratulations to all athletes and coaches, and best of luck to those competing in the post-season!